In the United States, approximately 70% of individuals 65 and older will require long-term care (LTC), and a majority of these older adults will have dementia (Harris-Kojetin, Sengupta, Park-Lee, & Valverde, 2013). Person-centered care (PCC), which respects an individual's preferences, is viewed as the standard of care, but can be challenging to operationalize in an institutional setting, especially for individuals with dementia (Maslow, 2013). The use of individualized music (IM), in which pre-recorded music that aligns with resident preferences is offered by family or care staff for independent listening (Gerdner, 2013), provides an opportunity to operationalize PCC principles (Skrivervik, Buettner, & Testad, 2012) and complies with regulatory expectations for the use of nonpharmacological interventions rather than antipsychotic medications for behavioral symptoms in individuals with dementia (American Geriatrics Society, 2015; Centers for Medicare & Medicaid Services, 2016; Gerdner, 2012). IM programs are an appealing alternative to medications because they are economical, carry a low risk of harm, are readily available to nursing staff and families, engage multiple departments, and can reduce or prevent agitation (Gerdner, 2012). Because IM uses pre-recorded music that can be administered by family or care staff, there is no need for specialized staff to implement the program, as is true for traditional music therapy (Ueda, Suzukamo, Sato, & Izumi, 2013). IM has been associated with a variety of positive outcomes among residents with dementia, including reductions in anxiety (Gallagher, 2011; Sung, Chang, & Lee, 2010), agitation (Gerdner & Schoenfelder, 2010; Ridder, Stige, Qvale, & Gold, 2013; Sung, Chang, & Abbey, 2006), disruptive behaviors (McDermott, Crellin, Ridder, & Orrell, 2013; Raglio et al., 2013; Ridder et al., 2013; Thomas et al., 2017), depression (van der Steen et al., 2017), antipsychotic and anxiolytic medication use (Thomas et al., 2017), and pain (Park, 2010). However, benefits of IM programs in LTC are not limited to residents with dementia. In one of the few studies of cognitively intact residents listening to individually chosen music, residents exhibited improved feelings of well-being immediately after a music intervention but did not experience an improvement in global quality of life (Burack, Jefferson, & Libow, 2003). In addition, significant increases in staff knowledge (p < 0.001), confidence in using music with residents, and adherence to a protocol have been found in hospice and LTC settings when implementing an IM program (Gallagher, 2011; Sung, Chang, & Abbey, 2008). Thomas et al. (2017) suggest that future studies must examine IM implementation processes to “optimize program performance and ensure optimal resident outcomes” (p. 936). The process and sustainability of innovative programs such as IM warrant a formal implementation evaluation to hasten their effective translation to practice (Gerdner, 2013; Rahman, Applebaum, Schnelle, & Simmons, 2012), so that the opportunity to access music and other personal interests of LTC residents is enhanced (Burack et al., 2003). Implementation science methods assist organizations in integrating research findings into practice systematically (Titler, Everett, & Adams, 2007). The Promoting Action on Research in Health Sciences (PARiHS) framework was developed to guide implementation of evidence-based health care interventions in a prospective and evaluative manner (Squires et al., 2012; Stetler, Damschroder, Helfrich, & Hagedorn, 2011). PARiHS integrates the interactive elements of evidence, context, and facilitation that influence systems change. The use of a structured process for implementation and evaluation may accelerate translation of IM research to LTC practice settings (Kitson & Harvey, 2016). The current study addresses the knowledge gap of how to operationalize IM in a LTC setting through applying implementation science principles. The aims of the study were to: (a) explore the barriers to and facilitators of making IM available to LTC residents through a structured implementation process, guided by the PARiHS elements of evidence, context, and facilitation; and (b) describe IM use by LTC residents following implementation. The overarching goal of the study was to provide a comprehensive description of IM implementation. A qualitative design was used to explicate the process of IM implementation. Quantitative data were used to describe the outcome of the implementation process. Linking data from multiple sources is critical to implementation studies (Fisher, Shortell, & Savitz, 2016). Through its defined elements (Table 1), the PARiHS framework provided a structured approach to evaluate IM implementation over a 6-month period comprehensively. Qualitative interviews of key resident and staff stakeholders at the initiation and completion of the IM implementation period were used to identify barriers and facilitators. Quantitative data on residents' access to their music device and use of IM were collected at the end of the implementation period. This study was approved by the Charles George Veterans Affairs Medical Center (CGVAMC) Institutional Review Board (IRB) and the East Tennessee State University IRB. A waiver of informed consent was approved for residents receiving IM, as the intervention was considered usual clinical care. Only residents deemed capable of self-consent by providers participated in an interview, and all signed an informed consent. The study was conducted in the Community Living Center of the CGVAMC providing LTC and rehabilitation services. All residents with a length of stay >3 months (N = 23), regardless of cognitive status, were eligible to receive IM as a study participant. The resident population was predominately male. Narrative semi-structured interviews with purposively selected residents (n = 3) and staff (n = 6; nurse leaders, staff nurses, nursing assistants) were conducted. These individuals are key stakeholders in process change based on their experiences of living and working within the facility. Implementation evidence is socially constructed; therefore, qualitative interviews are congruent with the PARiHS framework (Stetler et al., 2011). All staff and residents approached for an interview agreed to participate. Resident participants' ages ranged from 66 to 96 (mean age = 79.67 years, SD = 15.18 years), and 100% were male, 66% (n = 2) were White, and 33% (n = 1) were Black. Staff participants' ages ranged from 24 to 56 (mean age = 41 years, SD = 14.31 years), and 50% (n = 3) were female, 66.7% (n = 4) were White, and 33.3% (n = 2) were Black. All LTC residents were offered IM by investigators. Each resident who expressed an interest in having a personalized playlist on an MP3 player was interviewed using the Assessment of Personal Music Preference (APMP), a questionnaire designed to elicit resident music preferences from either the residents themselves or family members or friends (Gerdner, 2013). 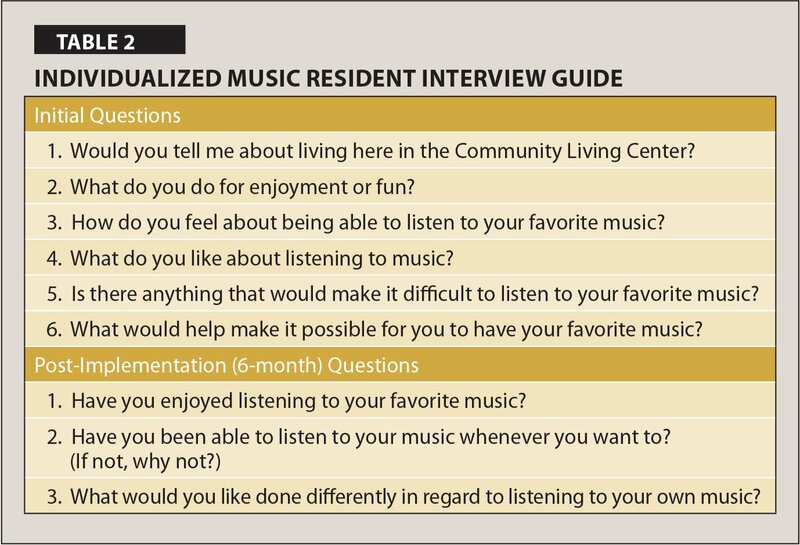 The APMP contains questions such as, “Before you came to live here, how important of a role did music play in your life?” and asks about music genres to engage the interviewee in selecting favorite artists and songs. If the resident was not able to verbalize his or her music preferences, family, friends, and staff contributed ideas and evaluated the resident for a favorable response when listening to music (i.e., smiling, toe tapping, calm demeanor). Staff, residents, and families collaborated in the development of playlists for residents. Listening times were individualized based on resident preference and response. Because the MP3 player was stored in their rooms, residents and staff could access their music at any time. Comfortable headphones were provided, and a speaker was offered for residents who did not wish to wear headphones. Residents who were able to use their devices independently did so; otherwise, residents requested or were provided assistance from staff. Staff on each shift were responsible for documenting residents' music use in the electronic health record (EHR). Five IM staff champions were self-selected and attended a 4-hour IM workshop offsite. Other staff members were educated about IM through bulletin boards and online and one-on-one training. Implementation progress was discussed at monthly leadership meetings. Staff documentation of IM use was audited at 6 weeks, and due to low compliance, online education was provided with a subsequent increase in documentation. To aid in identification of barriers to and facilitators of IM implementation by residents and staff, the current authors developed semi-structured interview guides based on the PARiHS elements (Table 2 and Table 3). Investigators (C.A.H., K.H.) performed and transcribed the interviews at the initiation and completion of the 6-month implementation period. Investigators (C.A.H., K.H.) recorded field notes throughout the implementation period, which included rounding in resident areas, staff meetings, and interactions with staff members during IM coaching sessions or informal discussions. Demographic data were gathered from participants (staff) and the EHR (residents). 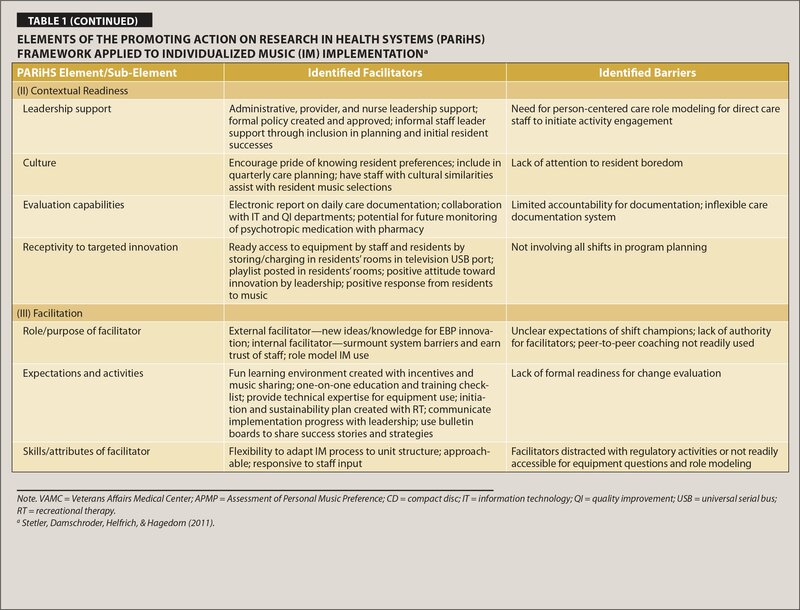 To evaluate implementation and sustainability success, criteria for successful implementation (Stetler et al., 2011) were defined at the outset: (a) each resident requesting IM has access to his or her music device for 6 months, and (b) each resident listens to IM at least two times per week (Raglio et al., 2015; Sung et al., 2006; Sung et al., 2010). Investigators determined resident access to music device by the presence of the device in residents' rooms at the end of the 6-month implementation period. Investigators ran an electronic report of staff documentation to calculate resident IM use. Descriptive analysis was performed using SPSS version 23.0. 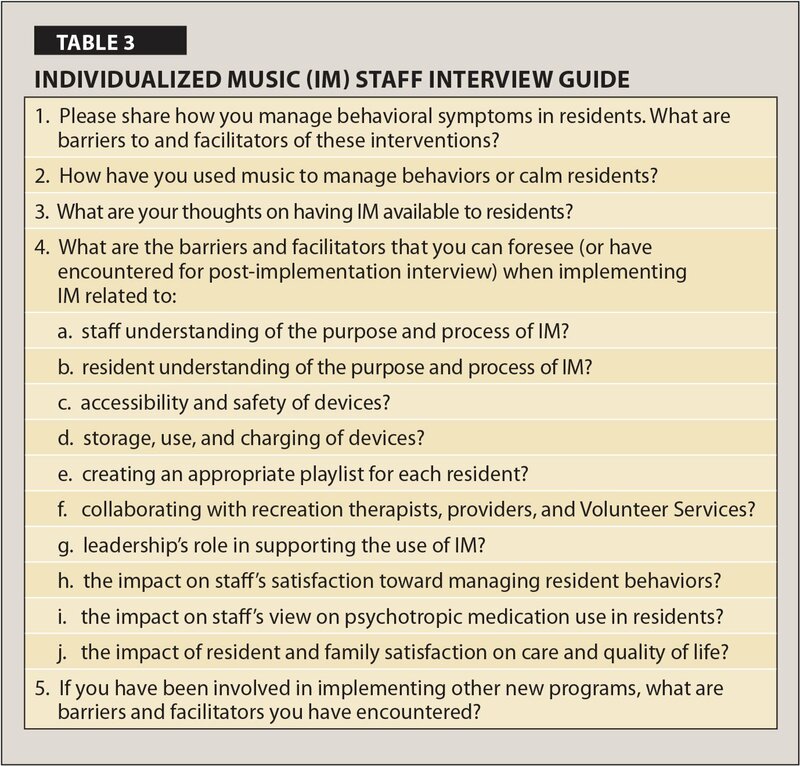 Descriptive data included demographics related to resident IM and interview participants, and IM measures of implementation success (i.e., access to listening device and use of IM). Qualitative descriptive analysis was used to interpret resident and staff interview data and field notes captured by investigators during the 6-month implementation period (Miles, Huberman, & Saldana, 2013). Narrative interview data and field notes were first read to gain an understanding of the data. On subsequent readings, investigators separately identified units of meaning and coded 20% of the data. Codes were compared and discrepancies resolved through discussion. One investigator then completed coding on the remaining data. To enhance confirmability, 30% of the data was recoded after 10 days, and discrepancies were resolved through discussion between investigators (Miles et al., 2013). Similar codes were then clustered to create categories and themes. The final composition of themes and categories was agreed on by both researchers. Results were member checked with three study participants through discussion of themes with an investigator (C.A.H. ), including an opportunity to provide feedback; other participants chose not to contribute. Participant demographics are summarized in Table 4. Each of the 23 residents was offered IM, and 19 (82.6%) residents chose to participate in the study. All participating residents had their MP3 device readily available in their room upon completion of the study, and 10 (53%) of 19 residents had IM documented at least two times per week. Two residents declined to use headphones and alternatively used a speaker connected to the MP3 device. All equipment was donated by Voluntary Services, the local Area Agency on Aging, and staff members. Equipment included MP3 players ($1,250), music purchases ($300), and headphones ($295) for a total value of $1,845. The PARiHS framework (Stetler et al., 2011) guided IM implementation through identification of barriers and facilitators within the three core dimensions (Table 1): (a) evidence and characteristics of the IM practice innovation, (b) context (i.e., a LTC unit in a hospital system), and (c) facilitation (i.e., creating a system supportive of resident IM use). Specific implementation strategies were designed to capitalize on facilitators identified and address barriers prospectively. 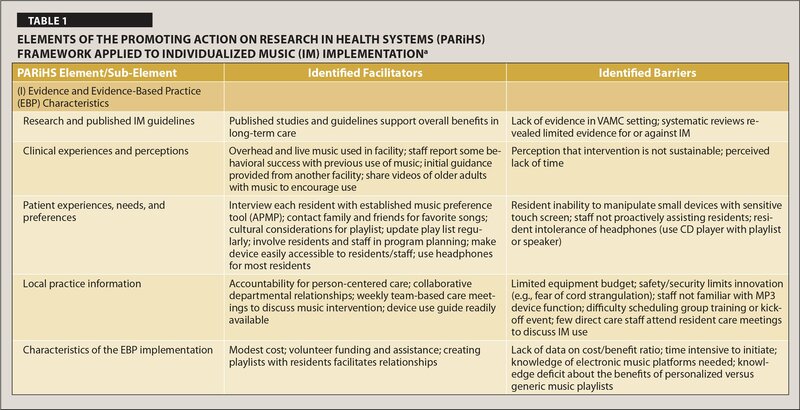 Qualitative data reduction from participant interviews and implementation field notes led to the emergence of two themes: Overcoming Resistance to Innovation and Person-Centered Care Through Individualized Music. Theme 1: Overcoming Resistance to Innovation. Although staff throughout the health system stated that IM “is a great idea,” multiple barriers arose during implementation based on system regulations and staff perceptions of their roles. There was a sense from some individuals that the staffing model could not support this innovation, as stated by a nurse, “This can't all fall on nursing.” Several staff members appeared hesitant to become involved with a project likely to dwindle away. As one staff member said, “I can't help wondering if this is just the flavor of the month.” Interdepartmental collaboration from RTs and volunteers helped overcome these concerns. Influence of the medical model. The facility endorsed PCC principles, but resident care and activities were often oriented toward medical needs due to system design. Staff members expressed concern about not having the proper environment to institute nonpharmacological approaches. One nurse reported, “A health system model doesn't suit long-term care. This is their home. We should be adapting to them, not the reverse.” A resident also noted challenges by stating, “Sometimes I get tired of following a schedule. I want to do my own thing.” IM fostered a holistic rather than medical focus. Validating resident identity and agency. Staff prided themselves in honoring the preferences and routines of residents and several actively joined the facilitators in developing playlists. As one resident shared, “My favorite music is tattooed on my heart; I wouldn't want to live without it. Everyone has music that touches their soul. You just have to find it.” Having music based on their personal preferences readily available in their room facilitated resident agency and identity. As one resident stated, “We are the soldiers; we know what we want.” IM provides residents with an opportunity to listen to music of their choice, at a time of their choosing. One resident stated, “I like having the music right here where I can have it anytime. It's like a muscle relaxant; it calms me down.” A person-centered approach was enriched by facilitating resident agency through access to a meaningful activity. The current study found that the PARiHS framework offers a useful structure for IM implementation by providing a structure for identifying barriers and facilitators, thus helping operationalize IM to support PCC in residents with and without dementia. In an examination of nine Quality Enhancement Research Initiative programs within the United States Department of Veterans Affairs, Ullrich, Sahay, and Stetler (2014) reported that implementation study leaders characterize the PARiHS model as “easy to directly apply across diverse implementation projects, settings, and stages” (p. 30). This observation resonates with LTC practice translation and the experience in the current study—when staff lack support of advanced clinicians, a structured approach is beneficial to guide implementation of new care practices. The synthesis of qualitative and quantitative data in the current study revealed that although the PARiHS framework provides a useful structure, implementation was only partially successful. Although 100% of participants had access to their music device at the end of the study, only 53% of participants met the goal of IM use of two times per week. These results are not unexpected, as not all barriers identified by PARiHS were overcome. IM implementation will be examined through the PARiHS elements of evidence, context, and facilitation. As part of the implementation process, research findings related to IM were supplemented with local clinical expertise and resident perspectives to broaden the sources of evidence. Other IM studies have not noted the finding that even residents without cognitive impairment require assistance with music devices. The small features and sensitive touch screens proved challenging for residents with limited sensation and dexterity. Larger tablet-sized devices could prove easier but are more costly. Involving older adults in evaluation of technology design could be valuable in promoting IM (Riikonen, Paavilainen, & Salo, 2013). In addition, residents needed assistance to update their playlists. IM is a process that requires continual staff engagement. Results of the current study confirmed findings from other studies that music is a meaningful activity and helps build relationships between staff and residents, which may facilitate staff satisfaction and retention (Gallagher, 2011; Gerdner, 2013). McDermott, Orrell, and Ridder (2014) found that family members, caregivers, and participants reported improved social connectedness when incorporating music in their interactions. Gallagher (2011) found staff reported greater opportunity for interactions with residents when using IM. The current study found that having staff of the same ethnicity as residents facilitated creating meaningful playlists, consistent with Gerdner's (2015) recommendation. Skrivervik et al. (2012) found that the interaction involved in creating and maintaining a meaningful IM playlist reinforces resident involvement and relationship building with staff, and therefore promotes PCC. PCC principles emerged in the current study through engagement of residents in actively making choices and thus relieving boredom. Staff and residents developed a bond working together to make music part of the unit identity. Veterans have reported music as a factor affecting their well-being in adapting to LTC (Kirchen & Hersch, 2015). Music preferences are part of one's identity, and continuity of identity promotes dignity (Gerdner, 2012; Maslow, 2013). All residents receiving IM had continued access to their music device at the end of the study, indicating program sustainability, even with equipment stored unlocked in resident rooms to promote ease of use. Equipment loss has not been examined in other studies but is an important consideration as it was considered a barrier by staff. The current equipment costs ($1,875) are comparable to reported costs of other IM programs, and were obtained via donations (Burack et al., 2002; Thomas et al., 2017). The reasonable cost along with minimal equipment loss (two devices) attests to IM as a cost-effective intervention, an important consideration within limited LTC budgets (Gallagher, 2011). Investigators in the current study identified the LTC unit's readiness for an IM program through merging the interview results (Table 2 and Table 3) and implementing process experiences into the PARiHS elements to construct a comprehensive view of barriers and facilitators (Table 1). Gibb (2013) also used the PARiHS framework to assess readiness for change in an aged care workplace by integrating interviews, surveys, and observation to deepen the understanding of implementing a teamwork model. In the current study interviews, a barrier related to outcome measures was identified—non-licensed staff's reported difficulty in accessing computers for documentation coupled with a lack of accountability for documentation. Ongoing auditing and feedback have been demonstrated to improve compliance with IM (Sung et al., 2008) and could have been instrumental in increasing adherence rate in the current study. The medical model and task orientation of direct care staff was a barrier to IM implementation in the current study. Staff members required coaching to assist with music because they did not view it as part of their role. Gibb (2013) found leadership to play a pivotal role when instituting practice change in aged care. Role modeling by leaders in the current study promoted engagement of staff and residents in meaningful activities. Enlisting interdepartmental collaboration proved essential. Transformational leadership supports IM innovation through enabling a shared vision of culture change (Rycroft-Malone, 2004). IM supports and is supported by LTC culture change. In the current study, the external and internal facilitators managed devices and playlists; engaged staff champions, leadership, and interdepartmental support; sought resident and staff input; and provided feedback to leadership and one-on-one training. A 53% compliance rate with twice weekly IM was observed, which may have been related to the implementation strategy. IM implementation benefits from tailored education and multi-modal implementation strategies. Sufficient support was unavailable to provide formal training and ongoing auditing; therefore, one-on-one instruction was used. Nursing staff in Taiwan reported lack of knowledge as the greatest barrier to use of music with residents (Sung, Lee, Chang, & Smith, 2011). In the current study, electronic documentation was used rather than staff self-reports to measure IM adherence, which could be more effective in providing objective and timely feedback. Sung et al. (2008) combined interactive education, reminders, views of local opinion leaders, and auditing to increase IM program adherence. Strategically strengthening the components of each PARiHS element has the potential to improve the level of implementation success (Rycroft-Malone, 2004). There were several limitations in the current study, most importantly the small sample size, which limits generalizability of the findings. In addition, the sample comprised primarily male Veterans, which differs from other LTC settings where female residents often predominate (Harris-Kojetin et al., 2013). The current study focused on the IM implementation process rather than resident outcomes. Future implementation studies should evaluate the effect of IM on outcomes such as PCC, quality of life (van der Steen et al., 2017), and well-being (Burack et al., 2003) while carefully describing the implementation process using designs such as pragmatic trials. Including cognitively intact residents in research will foster broader use of IM as a person-centered approach. Based on the positive reaction of staff to IM in the current study, staff satisfaction and retention should also be monitored. Findings from the current study contribute new knowledge to LTC practices by providing a structure for IM implementation and evaluation. As implementation science evolves, its theoretical base is continually refined and strengthened through application of models such as PARiHS in clinical practice (Ullrich et al., 2014). With proper planning to capitalize on facilitators and overcome barriers within each element, the PARiHS framework provides a comprehensive strategic guide for implementation of IM programs, which have the potential to strengthen PCC. Gerdner, L.A. (2013). Evidence-based guideline: Individualized music for persons with dementia (5th ed.). In Titler, M. (Ed. ), Series on Evidence-Based Practice for Older Adults. Ann Arbor, MI: National Nursing Practice Network; University of Michigan, School of Nursing. Harris-Kojetin, L., Sengupta, M., Park-Lee, E. & Valverde, R. (2013). Long-term care services in the United States: 2013 overview. 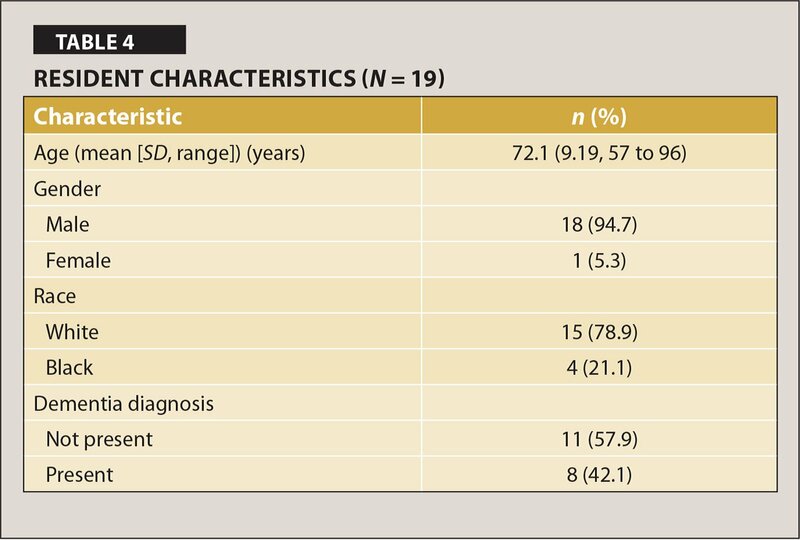 Vital & Health Statistics, 3(37), 1–107. Maslow, K. (2013). Person-centered care for people with dementia: Opportunities and challenges. Generations, 37(3), 8–15. Miles, M.B., Huberman, A.M. & Saldana, J. (2013). Qualitative data analysis: A methods sourcebook (3rd ed.). Thousand Oaks, CA: Sage. 1. Would you tell me about living here in the Community Living Center? 2. What do you do for enjoyment or fun? 3. How do you feel about being able to listen to your favorite music? 4. What do you like about listening to music? 5. Is there anything that would make it difficult to listen to your favorite music? 6. What would help make it possible for you to have your favorite music? 1. Have you enjoyed listening to your favorite music? 3. What would you like done differently in regard to listening to your own music? 1. Please share how you manage behavioral symptoms in residents. What are barriers to and facilitators of these interventions? 2. How have you used music to manage behaviors or calm residents? 3. What are your thoughts on having IM available to residents? a. staff understanding of the purpose and process of IM? b. resident understanding of the purpose and process of IM? c. accessibility and safety of devices? d. storage, use, and charging of devices? e. creating an appropriate playlist for each resident? f. collaborating with recreation therapists, providers, and Volunteer Services? g. leadership's role in supporting the use of IM? h. the impact on staff's satisfaction toward managing resident behaviors? i. the impact on staff's view on psychotropic medication use in residents? j. the impact of resident and family satisfaction on care and quality of life? 5. If you have been involved in implementing other new programs, what are barriers and facilitators you have encountered? Dr. Hebert is Nurse Educator, and Ms. Hancock is Nurse Educator, Charles George Veterans Affairs Medical Center, Asheville; and Dr. McConnell is Associate Professor, Duke University School of Nursing, and Core Investigator, Geriatric Research, Education and Clinical Center, Durham Veterans Affairs Medical Center, Durham, North Carolina. The authors have disclosed no potential conflicts of interest, financial or otherwise. This material is the result of work supported with resources and the use of facilities at the Charles George Veterans Affairs Medical Facility and Community Living Center (CLC). The authors acknowledge Jane Shealy for her contributions to the editing of this manuscript, the CLC staff and residents for joining this pursuit of joy, and the Land of Sky Area Agency on Aging for leading the community effort. Address correspondence to Catherine A. Hebert, PhD, RN, GCNS-BC, Nurse Educator, Charles George Veterans Affairs Medical Center, 1100 Tunnel Road, Asheville, NC 28805; e-mail: Catherine.hebert@va.gov.